Although it's great to have the third row seat in an SUV of this size, you can't really deny that legroom wise, these perches were clearly meant for children or those adults less than 5 feet tall. It also takes a bit of a contortionist act to maneuver your body past the second row of seats into the third row should you be so inclined to acts of sadomasochism. That is thankfully not so true of the 2014 Kia Sorento as it is of its competition thanks to being built on an all-new platform. We absolutely love the 3.3 liter 290 horsepower/252 lb. feet of torque V6 engine that is standard with the top of the line SX trim thanks to its excellent ability to make this a capable tow/haul machine but that it also makes this SUV feel quite quick and nimble on its feet. Or should we say tires? It doesn't hurt that the engine also makes a glorious high rpm wail not unlike those we know from Honda 6-cylinders. Our top of the line SX Limited model started at $38,000 and came standard with the 3.3 liter V6, 6-speed automatic, dual zone climate control, UVO, Bluetooth, USB/i-Pod integration, a premium Infinity sound system, Nappa leather seats, ventilated/heated front seats, heated 2nd row seats, heated steering wheel, a blind spot monitoring system, back-up camera, in-dash navigation, a panoramic sunroof, Xenon HID headlamps, a power lift gate, 19-inch chrome alloy wheels and more. Additionally, there was a $1,000 charge for the third row of seats (which also nets you rear A/C) and $50 for a cargo net. The total? $39,900 with destination charges. Ouch. Our test 2014 Kia Sorento SX Limited is EPA rated to get 18 city/25 highway on regular unleaded gasoline and during a weeklong stay with us we averaged 19.9 miles per gallon mainly due to a predominance of city driving. We also tend to be led foots but even if that is true of you, a 17.4 gallon fuel tank will ensure that you can still enjoy long cruising distances. If it ain't broke don't fix it must have been Kia's motto for this ever so subtle redesign on the exterior and interior. The overall shape of the SUV is still the same and that's no bad thing as it has a classy air much like that of a shrunken Acura MDX. New tail lamp designs add visual interest where before it just appeared Kia had run out of stylistic ideas. So that's a positive. Otherwise, the front end looks rather regal with its brassy chromed out grille which is emotive of both Audi and Acura's more controversial shield grille corporate front end design. No matter, Kia has clearly signed on to the concept of giving all of their cars and SUVs a "corporate face" so they are all easily identifiable and on that count Kia has succeeded. As for the rest of us, the 2014 Sorento looks modern, stylish and refreshingly simple compared to competitors who insert surreptitious slashes and bulges in bodywork to make up for a sense of cohesive style. Kia never seems to run out of that. Our test 2014 Kia Sorento SX Limited was a top of the line model and we were hugely impressed with the quality of the Nappa leather seat trim and the fact that both front seats were heated/ventilated which during a warm summer test week helped keep our bodies nice and cool when behind the wheel. Another favorite feature that enhanced not only the luxury feel of this Sorento but also improved the airy feel of the SUV's interior was a near full length panoramic sunroof spanning over front and rear seat passengers. Granted, this all pushed our final MSRP to nearly $40,000 but with all of those features the 2014 Sorento is clearly worth the price. Inside the 2014 Kia Sorento we loved the suppleness of the Nappa leather seats which are much higher quality than anything you have ever seen in any Sorento model before now. The center stack is updated as is the in car infotainment system known as UVO—both are even easier to use and never gave us a lick of trouble when it came to figuring out how to operate everything inside the vehicle. All V6 powered Sorento models are tow rated at 3,500 pounds which should accommodate most bike/trailer combinations you can come up with. As for hauling, behind the third row of seats there is a pretty measly 9.1 cubic feet of cargo space which grows to a far more useful 36.9 cubic feet when that third row is folded flat. Go one step further and fold the second row of seats and you will be left with a 72.5 cubic foot cargo hold capable of swallowing two weeks-worth of camping gear and supplies. Perfect if you plan to go dirt-bike riding. Thanks to the effortlessly powerful V6 we had powering just the front wheels it was very easy to get them to break traction when accelerating away from a stop. Perhaps a Sorento with the optional full time all-wheel drive system wouldn't suffer so much from this tire screeching malady but it did help make the SUV feel faster. Quick shifts from the six-speed automatic also didn't hurt matters on the acceleration fronts. It's too bad then that the steering feel is too overboosted in the 2014 Sorento as we could tell that with just a touch more feel this SUV would become one of the more fun to drive entrants in this size and price class. The Sorento does remain nice and flat during higher speed cornering maneuvers but if you push it too hard the driving experience just disintegrates into plowing oversteer. If Kia wants to be known as the Korean BMW it is going to have to work on this aspect of driving dynamics to build its first X5. Stopping distances were excellent as was the brake pedal feel. There was no discernible fade even in hot weather in deep and steady LA traffic. At a cruise the interior of the 2014 Sorento is nicely isolated from the elements with tire, wind and engine noise all kept at bay with Lexus-like precision. Too bad then about the steering as a positive change for 2014 could have turned this fine SUV into a great one. The 3.3 liter 290 horsepower/252 lb. feet of torque V6 engine features direct injection, variable valve timing and comes mated to an impressively smooth 6-speed automatic that is one of Kia's own designs. The motor is smooth and eager to rev and the automatic does its work in a suitably invisible and agreeable manner even when you ask for a multi-gear kick down. Not that you need to do that too often as this engine is plenty powerful on its own to have to rely too much on gearbox work to make the real power you need in every day driving and hauling. It boggles the mind how many three row 7-passenger family SUVs are on the market today from the Mitsubishi Outlander all the way up to the Land Rover LR4. 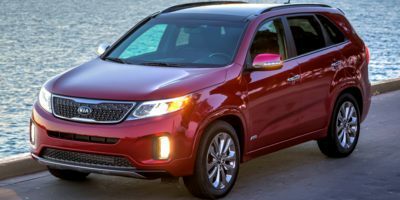 But we don't imagine much cross shopping between the Sorento and those two other SUVs as we think this is a very appealing vehicle that could fit the bill for any larger than average sized family. Or extended family as the case may very well be. If we were to name other models to also road test when considering the Sorento, on our short list would be the 2014 Ford Explorer, 2014 Mazda CX-9, 2014 Toyota Highlander and 2014 Hyundai Santa Fe. These four are all very safe bets as far as purchasing satisfaction goes and the Hyundai goes that extra step further and also shares the same basic platform with the Sorento. There is no denying that the 2013 Kia Sorento SX Limited is a very appealing crossover SUV what with its decent towing and hauling capabilities and luxurious interior. Add in a very competent powertrain, more standard features than any competitor at this price and that ten year warranty and you have a very appealing proposition for you, your family and your precious cargo. Our test 2014 Kia Sorento SX Limited was a top of the line SX model and we were hugely impressed with the quality of the Nappa leather seat trim and the fact that both front seats were heated/ventilated which during a warm summer test week helped keep our bodies nice and cool when behind the wheel. Another favorite feature that enhanced not only the luxury feel of this Sorento but also improved the airy feel of the SUV's interior was a near full length panoramic sunroof spanning over front and rear seat passengers. Granted, this all pushed our final MSRP to nearly $40,000 but with all of those features the 2014 Sorento is clearly worth the price. Interested to see how the 2014 Kia Sorento ranks against similar cars in terms of key attributes? Here are the 2014 Kia Sorento rankings for MPG, horsepower, torque, leg room, head room, shoulder room, hip room and so forth.